In Greek mythology, Eileithyia (or Ilithyia) was the goddess of childbirth who held the cow and the peacock as sacred animals. She was the daughter of Zeus, the king of all the other gods, and Hera, Zeus’s seventh and last wife, who was also his sister. 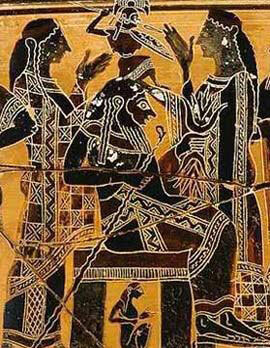 Eileithyia was born in a cave near Knossos, Crete, a cave that is mentioned in Book 19 of Homer’s The Odyssey. This cave became the primary place of worship for the goddess Eileithyia. She was also worshipped in Olympia, where a shrine to her was made. Inside the cave in Crete, the stalactites and stalagmites appear to symbolize the goddess’s double actions of bringing labor on and delaying it. The cave itself represents the darkness of the womb, and the passage out of the cave holds a connection to the birth canal. While her mother Hera dedicated herself to the care and protection of married women, Eileithyia connected herself to women in childbirth. Because of her relationship to women in childbirth, there is also a relationship of Eileithyia to the human midwife, a woman who assisted in the birthing of a baby. But, Eileithyia did not always help with childbirth. Sometimes she prevented or delayed births as she did with the birth laboring of Alcmene. This action was performed under her mother Hera’s orders. Hera, who felt bitter and resentful about her husband Zeus’s affairs, sent her daughter Eileithyia to sit outside the bedroom in which the beautiful Greek woman Alcmene, whom Zeus had made pregnant, labored in childbirth. As Eileithyia sat, she held her crossed legs together by folding her fingers tightly around them, magically delaying the birth of a boy. She did this to help her mother ruin the plans made by Zeus, Hera’s unfaithful husband. Eileithyia’s magic caused Alcmene’s labor to go on for days. Then, according to some tales, Galinthias, with the help of the Furies (female gods of Vengeance), tricked Eileithyia by telling her that the baby was born. Surprised by this news, Eileithyia opened her hands and leaped up. This reaction of Eileithyia’s permitted baby Heracles, who became a divine hero, to be born. When Hera learned of Galinthias’s trick, she changed this man who betrayed her into a weasel. Even though Eileithyia caused this delay of the birth of Heracles, she was admired along with Artemis, an Olympian goddess, and Persephone, a goddess of fertility, for bringing children out of the darkness into the light.